Trisha analyses the Trinamool Congress and Mamata Banerjee in particular in this election special guest blog. Why Didi? I don’t know. I am guessing it is because of the Bong connection or something. Here is Tee in her “Politic-ky” avatar! Mamata Banerjee is something of a black sheep of Indian politics. A diminutive figure, enrobed in a simple white sari, she started her career with the Congress (I) in the early 1970s, still in her teens. In 1984, she became one of the youngest parliamentarians elected into Lok Sabha. After accusing the Congress of behaving like a “stooge of the CPI (M)”, she formed the Trinamool Congress in 1997. In 1988, she held Samajwadi Party MP, Daroga Prasad Saroj by the collar and dragged him out of parliament to prevent him from protesting against the Women’s Reservation Bill. 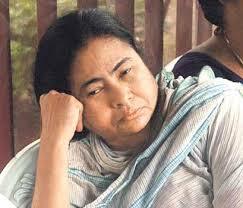 In 2011, she ended decades of CPI(M) tyranny and became the Chief Minister of West Bengal, at the tender age of 56. Why is this one woman at the centre of so much agitation? Didi, as she is affectionately known, is never not in the public gaze: whether it is for her impassioned anti-Communist rhetoric, or her equally impassioned anti-Congress, anti-BJP and anti-industry rhetoric. It is no secret that she has her eyes on a certain seat of power at the Center, and speculation was rife that she just might pull it off. First- BJP manages a majority (200+ seats). The BJP leadership will dictate the rules of engagement, and Trinamool hasn’t been their best pal in recent years. One cannot however rule out the possibility of an uneasy alliance, given that they did manage to cooperate in 1999-2000 for the Lok Sabha elections. Second- BJP obtains a good chunk of votes (130-180), but not a majority. It seems unlikely that Congress will manage a landslide akin to 2009, so Trinamool now has a choice- side with a current ally or a past one. The scales can tip either way. Third- No single national party manages quite enough votes. In such a case, it is likely to degenerate into a free-for-all. A coalition of authoritarians is more preferable than a dictatorship.The party that manages to nab UP will probably hold the most credence, and if Trinamool Congress plays its cards well, it can very well gain considerable influence. In the current environment of political ambiguity, it is difficult to accurately predict how the 2014 Elections will play out. Only one thing is certain, it may just mark the beginning of a new era of democratic politics and go down in the annals of history alongside 1977. My favourite piece Trisha .. you have truly suddenly made a leap .. pleasant and sweet surprise .. LOVED it!! Given that the BJP lacks presence in the South and the East, Mamata, Maya and Jaya will play an important role. It is an era of coalition politics and as you say things are fluid. After an year of comatose govt, I wish for stable times ahead. Amen. Votes in India are dangerously split along regional lines. A person in Delhi may rue being ruled by a regional leader from Bengal, just as a fellow sitting in Chennai may have great concerns about having a local Gujarati leader as PM. But, such is the reality on Modern Indian Democracy. This was a good essay, TR. While speculations are rife about the multitude of case scenarios possible, only time will tell what eventually happens. I liked your take on the situation – comprehensive and well written. Look forward to more. India has dirty politics , end of the day I feel no matter who you vote for they are all the same. and we the people still have thie AWE ohhhhh they are our leaders and still will vote for them ..